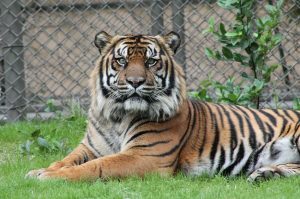 Sumatran tigers are a tiger subspecies found in the Indonesian island of Sumatra. 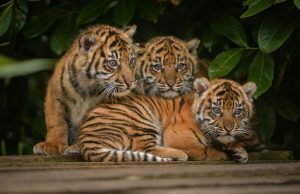 They are the smallest of all tigers, being comparable in size to a large leopard or jaguar. They are one of the endangered creatures of Sumatra, the others being the Sumatran orangutan, Sumatran elephant, and Sumatran rhinoceros. 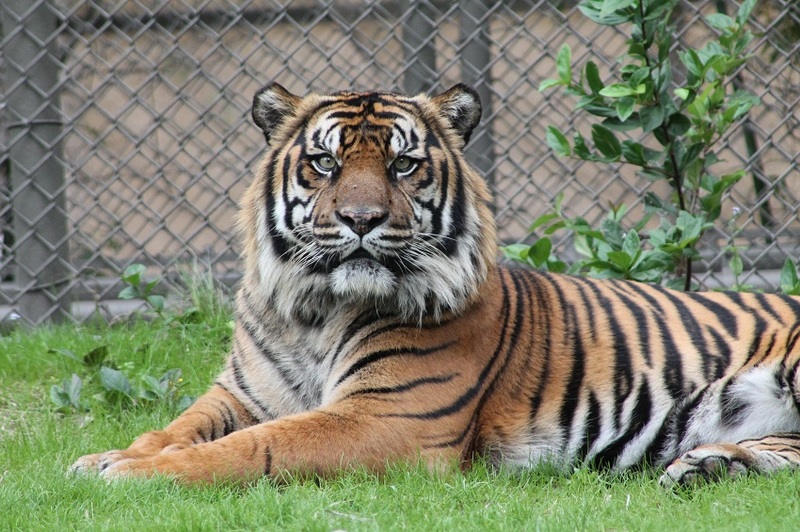 Size: Male Sumatran tigers measure around 87-98 in (2.2-2.5 m), while females are 85-91 in (2.2-2.3 m). Weight: Males weigh between 220 and 309 pounds (100-140 kg), whereas females are around 165-243 pounds (75-110 kg). 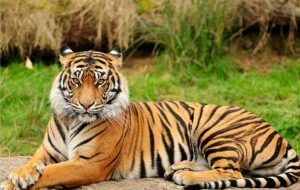 Color: They have the darkest pelage colors among all tigers, with the base color ranging from a reddish-yellow to a dark orange. The stripes usually end in spots. On the back, sides, and hind legs, the stripes have spots between them. The stripe density is more in the Sumatran subspecies than in any other. Ruff: Male Sumatran tigers have a prominent ruff around their neck. 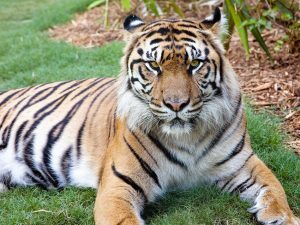 Bengal tigers are significantly larger and heavier than their Sumatran cousins. The Bengal’s pelage is also less dark than that of the Sumatran tiger. They have a life-expectancy of around 15-20 years in the wild, but in captivity, they can live for up to 25 years. These big cats are restricted to the island of Sumatra in Indonesia. They inhabit a variety of habitats, from sea-level up to 10,500 ft (3,200 m), and ranging from coastal lowland forests to those up in the mountains. They are solitary felines, seen together with another tiger only during the mating season and a mother with her cubs. 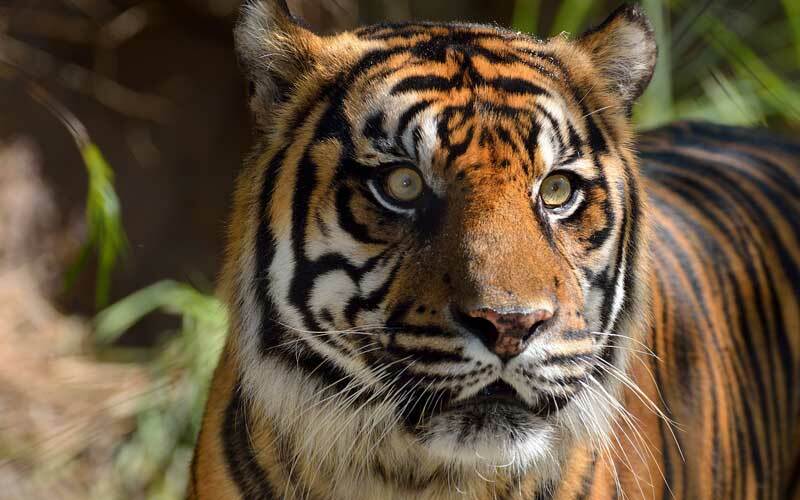 Having nocturnal hunting habits, Sumatran tigers spend most of their day at rest. They are territorial and do not allow the presence of conspecifics of the same gender within their territory. Male territories often overlap those of several females. They are one of only two cat species that enjoy a swim, the other being the jaguar. 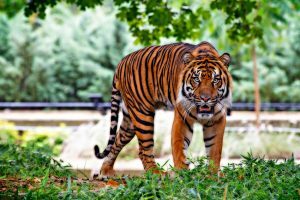 Sumatran tigers are obligate carnivores and are capable of taking prey considerably more massive than themselves. Their diet includes goats, wild boar, cattle, deer, fish, crocodiles, and fowls. Sumatran tigers mate year round. 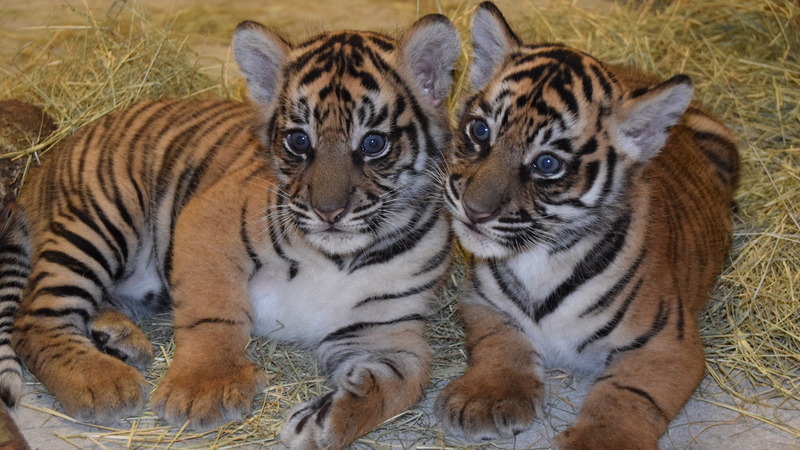 After a gestation period of around 90-110 days, a litter of 2-3 cubs is born. Newborns are helpless and can’t even see. The mother nurses them for 2 months before they are introduced to meat. They reach sexual maturity by the time they are 4-5 years old. 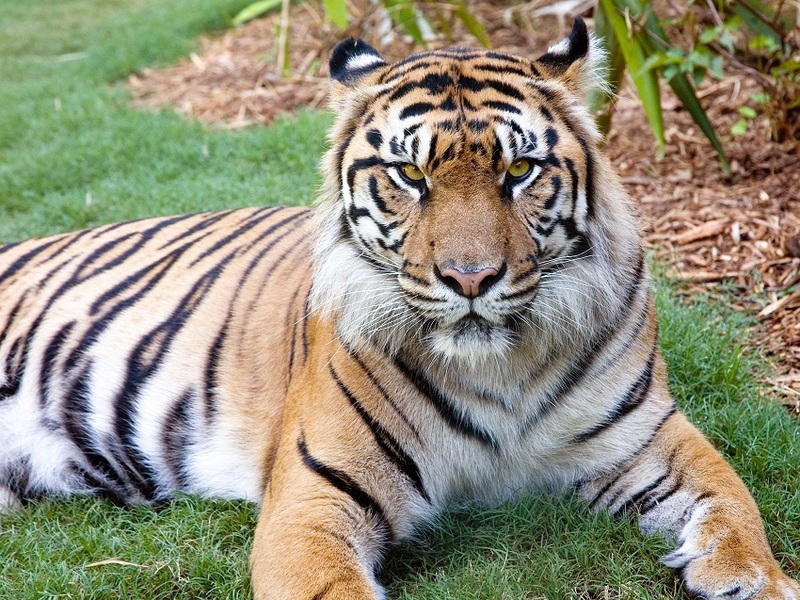 Tigers communicate between themselves by sounds ranging from roars to growls to chuffs. They mark their territories by scent marking and tree scratching. 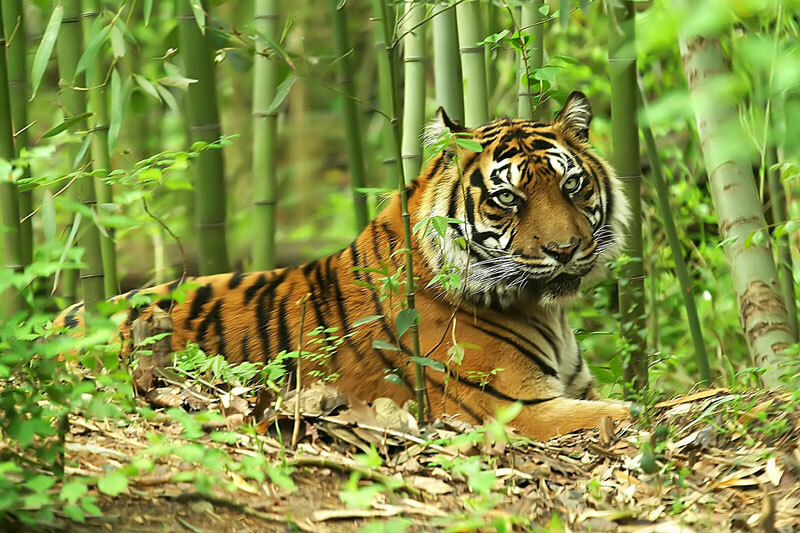 The striped fur of these tigers ensures that they remain camouflaged, hence unseen from potential prey. Their exceptional eyesight helps them see them in the dark. Sharp, retractable claws aid them to hold on to their prey once they have got their paws on them. Backward curved structures on their tongue aids in licking meat of a carcass to the bone. Since they love to spend a lot of time in the water, they have webbed feet that help them to swim exceptionally fast. Strong legs aid them to attain speeds of up to 60 miles per hour (96 km/h). Sumatran tigers are apex predators without any natural threat in the wild. The Sumatran tiger is listed under IUCN’s ‘Critically Endangered’ category. 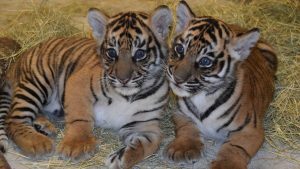 As of 2008, a population of 441-679 Sumatran tigers was estimated to be in the wild; the depletion of their population can be attributed to habitat loss due to the increasing acacia plantations, expanding palm oil plantations, loss of prey, and most significantly illegal hunting for the domestic market. Hunting the Sumatran tiger has been made illegal in Indonesia. Various organizations have committed to ensure that the population downtrend of these critically endangered big cats is checked and they thrive in their habitat. 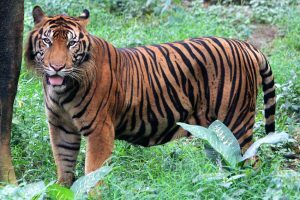 In 2017, the Sumatran, Java, and Bali tigers were assigned the scientific name t. sondaica, as the Sunda Island tigers. Both the other subspecies are now extinct.